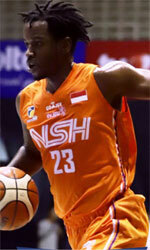 Pelita Jaya Energi-MP Jakarta (IBL) strengthened their roster with addition of 25-year old American center Jaleel Roberts (213-107kg-92, college: NC-Asheville). He played last summer at played at San Carlos in TBS league in Dominican Republic, but left the team in May'18. In 12 TBS games he recorded 6.4ppg, 6.2rpg and 2.3bpg. The last season Roberts played at Politehnica Iasi in Romanian Liga Nationala where in 8 games he averaged 7.3ppg, 6.6rpg, 1.1apg and 2.0bpg. Two years ago (a year after he left the college) Roberts was drafted by Santa Cruz Warriors (D-League) as #2 pick overall. He attended University of North Carolina - Asheville until 2015 and it is his fourth season in pro basketball. Roberts has tried to make it to the NBA and played in the NBA Pro Summer League in 2015. His team won Australian SEABL-East Regular Season in 2016. Roberts is quite experienced player. Thanks to his pro career he managed to play on four different continents (Europe, Latin America, Australia and of course North America). Roberts has played previously professionally in NBA (Milwaukee Bucks and Washington Wizards), NBA G League (Salt Lake City Stars) and Australia (Brisbane Spartans).